If you purchased Big Bank-issued trust preferred stocks (TRUPS) during the Global Credit Crisis (2007-2009), you have a significant unrealized capital gain staring back at you from your brokerage account. While the last two issues of the CDx3 Newsletter (July | August) have described the significant opportunity that the just-passed Wall Street Reform Act has created for preferred stock buyers, the Act has also created an equally significant opportunity for those considering selling their preferred stock shares. The provisions in section 171 of the Act have injected a layer of certainly about the future that allows preferred stock investors to determine whether we would be better off by (a) pocketing our crisis-generated capital gains or (b) holding, and continuing to collect more dividend income. The Act makes it very likely that Big Bank-issued TRUPS are going to be called once they reach/exceed their respective call dates, beginning on January 1, 2013. In the event of a call, shareholders will receive $25 per share. Since many of these TRUPS are available today for less than $25, preferred stock investors can position themselves for a nice capital gain on top of the 7+% annual dividend income, courtesy of the U.S. government (see this month's TRUPS table in the Special Announcement article below). Since the amount of your current unrealized capital gain is known (if you were to sell today), and the amount of the likely remaining dividend payout is also now known (if you were to hold onto your shares until they are called per the provisions of the new law), we can compare the two scenarios with substantially greater certainly than investors are typically use to. Because of the new law, effective January 1, 2013 Big Banks (assets greater than $15 billion) will no longer be able to count their TRUPS toward their reserves (“Tier 1 Capital”) and will therefore almost certainly redeem (“call”) them and replace them with new traditional preferred stock issues (which will still be allowed to be counted). So these trust preferred stocks have about nine quarters left before they start falling under the provisions of the new law. Big Bank-issued TRUPS pay about $0.50 per share in dividends every quarter. That means that any Big Bank-issued TRUPS that you happen to own that are redeemable (i.e. have a call date) prior to January 1, 2013 have about $4.50 in dividend payout left in the event they are redeemed by the issuing bank (which the new law makes very likely). $4.50 per share; that's what is likely left to make in dividends if you hold onto your shares. Now look at your brokerage statement. If you purchased any Big Bank-issued TRUPS during the Global Credit Crisis, it would not be unusual for your shares to be showing a current unrealized capital gain of more than $4.50 per share. Many such TRUPS that were purchased during the crisis for less than $20 per share are now selling for well above $25. Any Big Bank-issued TRUPS that you own where your unrealized capital gain is greater than $4.50 per share deserve special consideration. The capital gain that you would realize on such issues, if you were to sell now, is greater than the likely remaining dividend payout on these preferred stocks. While a $4.50 per share capital gain sounds like a lot (and, historically, it is), such unrealized gains are very common at the moment because of the rock-bottom preferred stock prices that we saw during the Global Credit Crisis (the crisis that keeps on giving). 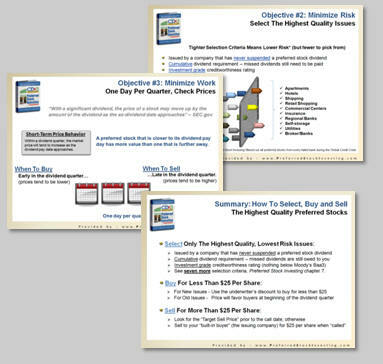 I'll show you how to run the numbers in a moment, but you are very likely to be money ahead by selling such shares now, and reinvesting the proceeds, since the capital gain that you would realize is now greater than the remaining dividend payout, in the event of a call. 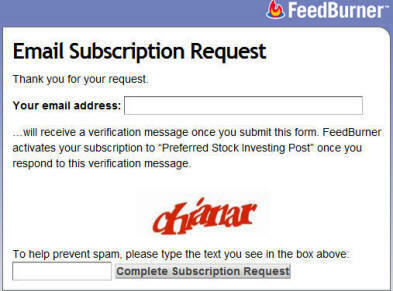 To protect the value of subscriptions to the CDx3 Notification Service (my preferred stock email alert and research newsletter service), I will use a real example here but substitute “PFD-A” for its real trading symbol. Already a subscriber? Check the CDx3 Discussion Group on the subscriber's website for this example's trading symbols. Say you purchased PFD-A (a Big Bank-issued trust preferred stock) in May 2009 for $20 per share. PFD-A has a coupon rate of 8.0%, has a call date prior to January 2013 and is selling today for about $26. So you would pocket a $6 per share capital gain if you were to sell your shares of PFD-A today. Table 1 shows what accountants refer to as a "Statement of Cash Flows" that itemized the cash in/cash out of your investment in PFD-A. 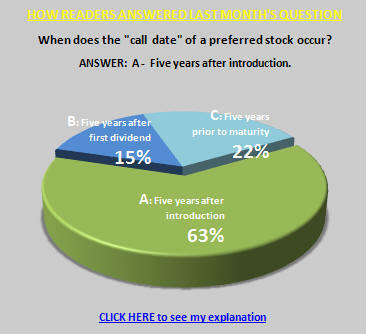 With a coupon rate of 8%, a share of PFD-A generates $0.50 per quarter in dividend income for you. That means that if you hang onto your shares of PFD-A it will take twelve more quarters (three years) for you to make the same $6 that you can make today in one shot by selling and pocketing the $6 capital gain. To many investors, having the $6 now rather than waiting three more years for the same money starts to make a certain amount of sense. But here’s where the new law makes this even more interesting. PFD-A is a Big Bank-issued TRUPS and therefore comes under the provisions of section 171 of the new Wall Street Reform Act. Since PFD-A has a call date prior to January 2013, it will almost certainly be called by the issuing Big Bank on or about January 1, 2013 when the new law kicks in. That’s nine quarters from now, which means that you are only likely to see $4.50 in remaining dividend payout ($0.50 per quarter times nine remaining quarters); short of the $6 that you need to break even. Now look at Table 2. Here I have added a second column that tallies up the cash proceeds if you were to sell PFD-A, collect the $6 per share capital gain, then reinvest the proceeds in PFD-B, another Big Bank-issued TRUPS that is currently selling for less than $25 per share. To find PFD-B I used this month's list of Big Bank-issued TRUPS from the below table in the Special Announcement article. Subscribers to the CDx3 Notification Service receive this same list each month, with trading symbols, in the subscriber's newsletter, CDx3 Research Notes. For our example here I selected a Big Bank-TRUPS that has a dividend rate (coupon) of 7.625%, which is as close to the 8% of PFD-A that I can get at the moment (the TRUPS list changes every month). The column that I have added to Table 2 shows your sale of PFD-A at today's price of $26.00 per share and your reinvestment of the proceeds in PFD-B at today's price of $24.89. For the remaining nine quarters, before the new law kicks in, you receive quarterly dividends of $0.48 per share from PFD-B. When PFD-B is called by the issuing bank on January 1, 2013 (per the new law) you receive $25 per share. Since the unrealized capital gain that you have sitting in your brokerage account for PFD-A ($6 per share) is substantially more than the remaining nine quarter's worth of dividend payout ($4.50), Table 2 shows that you are better off by selling PFD-A now and reinvesting the proceeds. While holding onto PFD-A until it is called (assuming that it is) earns you a total income of $12.50 per share, selling PFD-A now and reinvesting the proceeds, even in an issue that carries a lower quarterly dividend payment, provides you with total income per share of $13.43, almost a dollar per share more than continuing to hold PFD-A. While you give up $.018 per share in dividend income in this example ($7.50 versus $7.32), your capital gain income increases by $1.11 per share (from $5.00 to $6.11). And don't forget that capital gain income has, at least for the rest of this year, more favorable tax treatment (see your tax advisor). Whether or not to sell your Big Bank-issued TRUPS is a decision that only you can make in light of your personal financial goals, resources and risk tolerance. And remember that we do not know for sure that these Big Banks will, in fact, call their TRUPS (even though the new law eliminates the primary reason for keeping them on the books). But if you are considering selling and are not sure which issues might be good candidates, the just-signed Wall Street Reform Act has identified a good place to start looking - Big Bank-issued TRUPS that show a current, unrealized capital gain that is greater than the remaining dividend payout of $4.50 per share. Create your own table like the one seen here and plug in the particulars for your Big Bank-issued TRUPS. For a list of reinvestment purchase candidates that are currently selling for less than $25 per share, please consider subscribing to the CDx3 Notification Service today. Already a subscriber? Check out the CDx3 Discussion Group on the subscriber's website for this example's trading symbols. Section 171 creates the largest single opportunity for preferred stock investors in history (how's that?). The window of opportunity will be open at least until January 1, 2013, but like most investments, the highest returns will tend to favor those who get in earlier rather than later. The new law prohibits Big Banks (assets greater than $15 billion) from counting their TRUPS in their "Tier 1 Capital" calculation, a measure regulators watch when assessing the adequacy of a bank's reserves. These Big Banks are therefore likely to retire ("call") their TRUPS and replace them with new traditional preferred stocks. Investors who hold shares of a TRUPS when it is called will receive $25.00 per share, so investors who purchase shares now for less than $25 position themselves for a capital gain on top of the above-average dividend income that they will be earning in the meantime. BRE Properties is a $2.6 billion real estate investment trust (REIT) engaged in the development and acquisition of multi-family apartment communities in the western United States. BRE was founded in 1970 and is headquartered in San Francisco. How old were you when you finally told your folks that, as great as it has been, you were going to be striking out on your own? The current group finding itself in that position, referred to as "Generation Y" by those who come up with names for such things, numbers over 70 million, about one quarter of the entire U.S. population. Perhaps unfairly, this recession has locked a relatively huge percentage of Gen-Y young people in the same building with their parents well beyond the point where all involved would say is reasonable. Year after year, as unemployment has kept these young adults at home, the volume of those anxious to get over the wall has been swelling bigger and bigger. The only missing ingredient: a job. But take a look at this table. 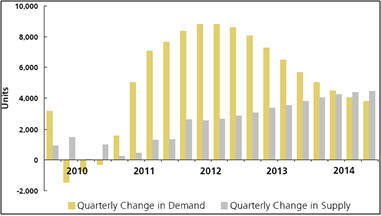 In the six core markets where BRE earns over 96% of its net operating income, employment is starting to turn positive. 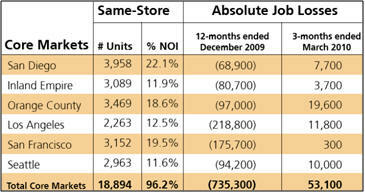 Up 53,100 jobs in just the first quarter of 2010. The number of young people about to move into their own apartment in these markets is staggering and BRE has positioned themselves directly in front of that parade. BRE's focus is very west coast centric with a special emphasis on property-constrained California. Any improvement in employment is going to release years worth of unmet demand into a severely supply-constrained geography. And studies also show that Gen-Y's propensity to rent, rather than to buy, a home is much higher than prior generations. On August 20, 2010, the company acquired 2.4 acres of land in downtown Sunnyvale, Calif. for approximately $19 million. The site will support the future development of 280 units. On August 31, 2010, the company acquired Aqua Marina del Rey, a 500-unit property in Marina del Rey, Calif., for a purchase price of approximately $166 million. On August 31, 2010, the company completed the sale of Boulder Creek, a 264-unit property in Riverside, Calif., for approximately $24.6 million, with an expected gain on sale of approximately $7.8 million. BRE's understanding of its markets and customers has allowed the company to continuously pay a common stock dividend to shareholders since its founding. Because of its strategic thinking and execution, the company has enjoyed a nice string of upgrades from analysts as well. Learn more about BRE Properties: Company website | Profile | Upgrades/Downgrades | Recent News. If I had to pick a single criteria out of the ten that was most responsible for saving preferred stock investors throughout the crisis, it would have to be CDx3 Selection Criteria #6 - Dividends must be "cumulative." (C) Cumulative dividends can be paid at any time while non-cumulative dividends are paid quarterly. 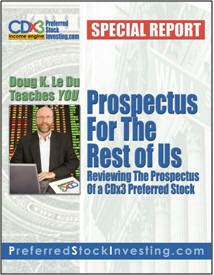 CDx3 Special Report "Prospectus For The Rest Of Us"
There is another mechanism at play here that will be very interesting to watch as we approach January 1, 2013 when section 171 of the Wall Street Reform Act kicks in. The provisions of the Act all but require that our Big Banks retire their callable trust preferred stocks, beginning on January 1, 2013, and replace them with new traditional preferred stocks. While the Act prohibits the inclusion of trust preferred stocks in the bank's reserve calculation ("Tier 1 Capital"), it allows banks to continue counting traditional preferreds toward this closely watched regulatory metric. Think about what that means for the supply (and therefore market price) of high quality traditional preferred stocks as January 1, 2013 approaches. We are likely to have a massive supply of new, very high quality traditional preferred stocks hit the market within a very short period of time. Capital One alone, for example, has about $3.5 billion of outstanding trust preferreds that will, in all likelihood, be retired and new traditional preferred stocks issued to replace them. And that's just one Big Bank; there are many more that fall under the TRUPS provisions of the Act - all at the same time. The last time we saw a huge spike in the supply of preferred stocks was when Freddie Mac and Fannie Mae introduced massive new issues (all non-cumulative of course) during the Global Credit Crisis within a very short period of time. The sudden increase in supply did what it always does - preferred stock prices dropped dramatically for about three months across the board, producing a very strong buyer's market for preferred stock investors. The last two issues of the CDx3 Newsletter (July | August) have described the unprecedented opportunity that the new Wall Street Reform Act has provided for preferred stock buyers. And in this issue I describe an equally interesting opportunity for preferred stock sellers, courtesy of the U.S. government. But there may be a third opportunity that has yet to reach us; the Act may create a temporary buyer's market as January 1, 2013 approaches and perhaps for a while thereafter, when we are treated to a massive smorgasbord of brand new, high quality, traditional preferred stocks available at dirt cheap market prices, at least for a few months.